Our Little Acre: How Do You Preserve Your Wood Items? 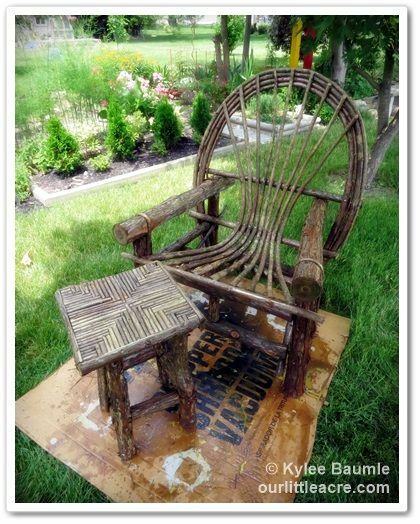 Recently, I purchased a new twig chair for the garden, because the one I bought five years ago deteriorated so much that it was rotting and breaking. We had to burn it, but I wanted another one like it. Thanks to the recommendation of one of my Facebook readers, I was able to find one near Toledo (East Swanton), at Oak Park Garden Center (and a matching side table, too). I wanted to do something to help preserve them, so I coated them with a wood sealer. I recently did the same to a wooden trellis and when I went to Lowe's to get the wood sealer, I asked for Thompson's. That's what we've used in the past and it's the best stuff, right? The associate in the paint department recommended a different product. She said Thompson's is wax-based and it breaks down in hot sunny weather. She recommended Olympic Wood Protector. The Olympic product cost nearly twice as much as the Thompson's, but you only have to apply it every two years, as opposed to yearly for the Thompson's. I don't know about you, but I'd rather do that unpleasant job half as often, even if I have to pay more up front. What are your thoughts on the two products? Care to share your experiences with either? Or maybe you use a different product altogether. Dish it to me! 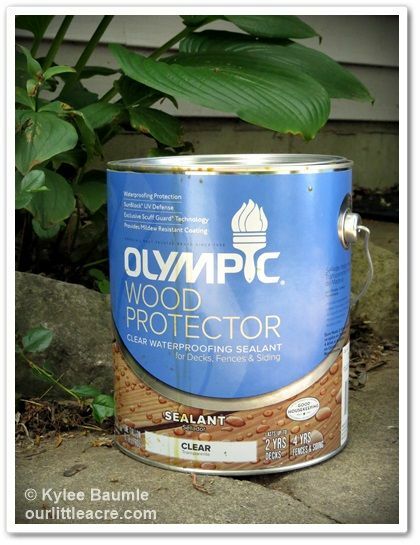 Though my purchase of the Olympic Wood Protector was not directly involved with my participation as a Lowe's Creative Ideas Team Member, I did use a gift card they provided to me as a part of that program to purchase this product. However, I would have purchased it regardless of whether I had a gift card or not. I agree with the comment about the Thompson's sealer~it was cheap in price with cheap results. Not sure we have Olympic products but we Have used Pittsburg Ulta Advanced Stain and Sealant in One...it's great coverage and so far, does not need to be resurfaced...it comes in clear~colored latex or oil base. BlessYa and good luck with Olympic. I'll be watching for results in a couple yrs.